Having just quit my job from a company that I created with a partner and then sold to a larger company, I found myself with an extraordinary amount of time on my hands. More leisure time than I have had since I left college and back then I was quite handy at wasting hours on end writing silly songs on my guitar. I had batted around the idea of driving up the coast to see my friend Aaron and then hiking half dome up in Yosemite for quite some time since I had seen another friend of mine post some pictures of his triumphant ascent of the rock. Given my fun-employment status I decided to drive up this week. On the way up the coast yesterday I had a chance to see something else I have wanted to see for a long time – Big Sur. Big Sur actually means “Big South” in Spanish, and if you have ever been up to this part of the central coast you will understand why. The cliffy coastline offers the most dramatic views off the West Coast. Stunning sheer cliffs drop of into the massive blue sea. The two lane highway is a stretch of 40+ miles of hair pin turns with the most amazing views you can find in California. Bixby Bridge is towards the north end of the drive and it is probably the most oft photo’d bridge on the drive. I always hate taking pictures of monuments or places that you would expect but I feel compelled for some reason. One good photographer I read about advised that you should always try to find something different when you are photographing something that is very common – a different angle, different colors, something unusual in the shot. When I was at Bixby Bridge, I just happened to notice a couple, holding each other and enjoying the moment. 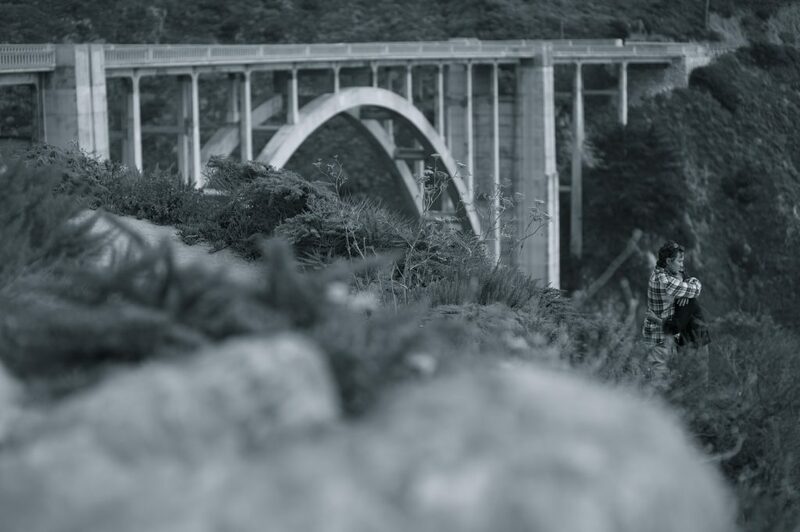 I decided to use them as my subjects and let Bixby Bridge in Big Sur act as the backdrop. The photo is not great but it did help me capture the monument and something different about the picture that might make it more interesting.